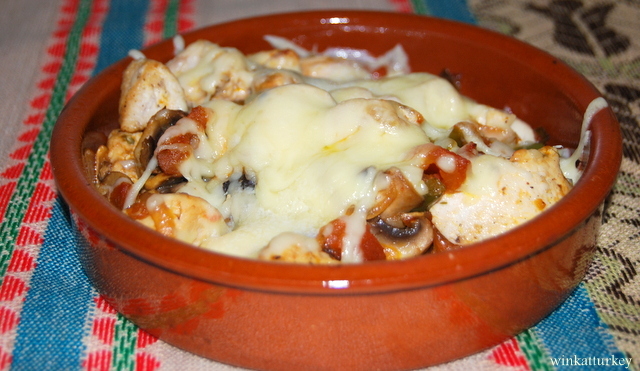 A very typical healthy and extremely tasty dish in Turkey, Casserole with mushrooms and chicken. And extremely easy to cook a dish that everyone likes. 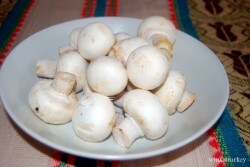 Moreover, if you have a celiac at home, this is a gluten free recipe. -1/2 kg boneless and chopped chicken . -Grated cheese or the cheese to melt. -Oregano, black pepper and salt. Remove the skin of tomatoes and grate or cut into pieces according your preference..
Fry the onion with some olive oil in a pan, When it becomes a little bit brown you add the garlic, peppers, tomatoes and cook it on medium fire a few minutes. Stirring slowly. 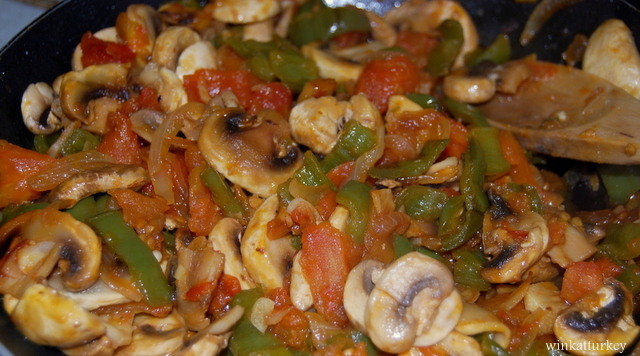 Add the mushrooms and sauteed all together one 5 minutes. Season the chicken and add some chopped oregano. 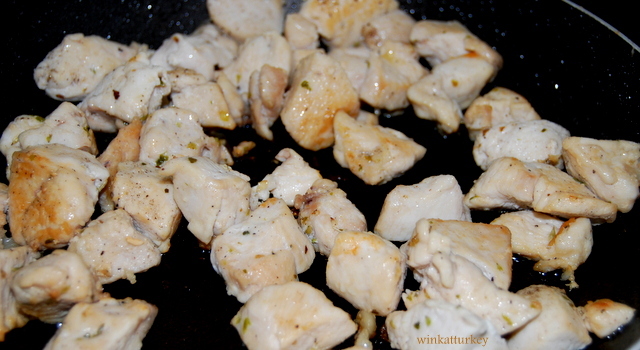 In another pan add a little oil and stir-fry the chicken until lightly browned. 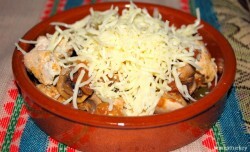 Mix the chicken with vegetables and distribute in clay pots to put them in the oven. mixture into. Sprinkle grated cheese over all or cover with some cheese to melt. Place in the oven at 180/220 º C until the cheese is melted and browned. And ready to serve.